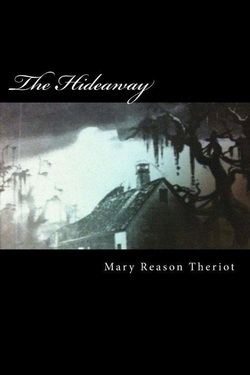 Louisiana-native, Mary Reason Theriot has lived in various states with her husband’s United States Coast Guard career. Until being diagnosed with Multiple Sclerosis in 2001, she worked in the legal field. Encouraged to write by her youngest child, she calls writing “great therapy for my own personal fight against MS.” The Hideway is her debut novel. Before you settle in to read this book make sure your doors are locked and draw the shades. The Hideaway will keep your heart racing in this spine-tingling murder-mystery filled with gripping suspense and intense romance. A nightmare is about to unfold in the idyllic town of Hope, Louisiana. Somewhere in the night, evil is in on the hunt. Suddenly Hope has become a dumping ground for the mutilated bodies of young women. Only the killer knows what sick and twisted tortures he has planned for his victim. With each murder this psychopath becomes even more ruthless. The killer is too precise, leaving behind no trace evidence. Who among the residents of this small town is doing this? Surely it can’t be someone who lives here? Detective Jordan Sanders is ambitious, stubborn and been told she is far too seductive to be a cop. Detective Sanders was not happy when the sheriff asked the FBI for assist. She has become obsessed with catching this sadistic killer. The FBI has sent in its top Profiler to help with the case. FBI Profiler Alex Hamilton is relentless during his investigations. He will stop at nothing put this maniac behind bars. Agent Hamilton is not what Detective Sanders was expecting. He is tall, dark and handsome. He knows he should stay far away from the determined Detective Sanders. The sexual attraction between them is too strong. Their passion burns hot and fast. Detective Sanders stirs a fire in him unlike any other woman and he can’t resist her. Agent Hamilton shows Detective Sanders a passion she never knew existed. Just a touch from Agent Hamilton sets her body on fire. If only he hadn’t entered her life at the wrong time. Could he possibly be the man needed to tear down the wall she has built around her heart? As they hunt for this elusive killer, Agent Hamilton soon realizes Detective Jordan Sanders has become hunted herself. The Hunter watches her every move, waiting for the perfect moment to strike. Will they be able to stop this maniac before Detective Sanders becomes his next victim?